Chelsea football club has let the FA know that they are not happy with the one match stadium ban handed down to manager Jose Mourinho following the Portuguese managers comments saying that referees are “afraid” to give decisions that favour Chelsea while other managers namely Arsenal’s Arsene Wenger escape any form of punishment. The Blues boss was also fined £50,000 after his comments following the 3-1 loss to Southampton, while Wenger escaped punishment after Arsenal’s 2-0 loss to Chelsea despite calling referee Mike Dean’s performance in the match referee Mike Dean “naïve” and “weak”. The comments that got Mourinho in hot water were what he said about Chelsea striker Radamel Falcao not being awarded a penalty against Southampton. He said: “I think, first of all, I want to say that because we are in such a bad moment you should not be afraid to be honest. “When we are at the top there is quite big pleasure in putting us down. But when you are so down I think it is time to be honest and say clearly that referees are afraid to give decisions to Chelsea. Given the fact both Mourinho and Chelsea knew the FA would come down on them for the remarks the 52-year-old manager had no option but to plead guilty to the charge of misconduct. The statement from the FA following the incident read: “Jose Mourinho has been given a suspended one-match stadium ban and fined £50,000 after he admitted a breach of FA Rules in relation to post-match media comments. 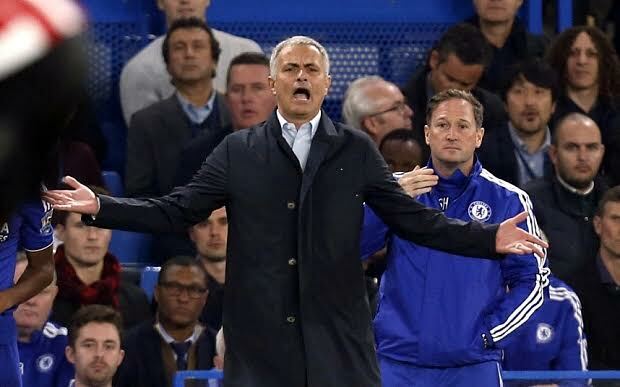 “The Chelsea manager was charged for misconduct following the game against Southampton on Saturday 3 October 2015. “It was alleged his remarks constituted improper conduct in that they alleged and/or implied bias on the part of a match official or match officials and/or brought the game into disrepute.